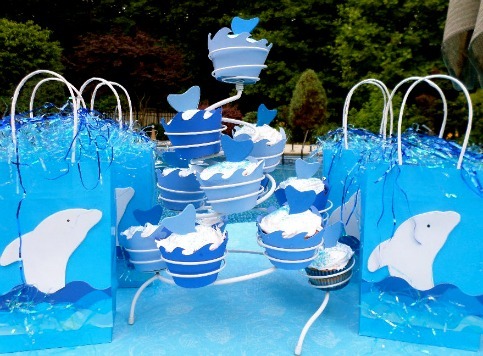 A dolphin pool birthday party was the theme chosen by our 9 year old granddaughter. Wearing foam glasses with dolphins, standing in front of a "sea of wildlife" was the perfect photo op. Guests were greeted by Flipper at the entrance to the pool. 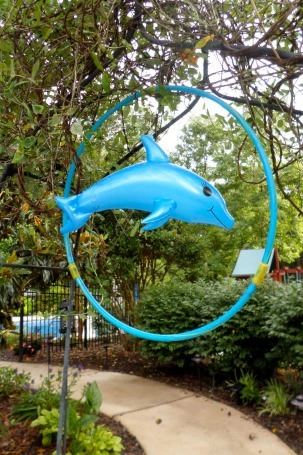 A hula hoop and dolphin were tied to the arbor structure with clear fishing line. I bought 6 large floating dolphins and 6 small ones. 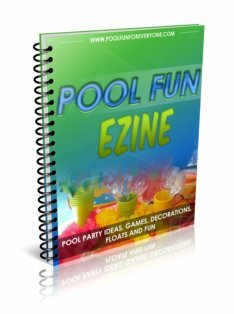 They decorated the pool and greeted the guests when they arrived. There is a small compartment on the bottom that is filled with water so that they stand upright. Be sure to fill it completely or the dolphin will not stand up straight. When the pool pump is on they glide across the water and look so happy. Place inflatable dolphins in the party area. 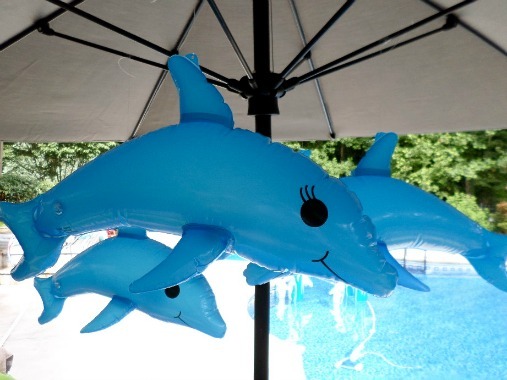 I bought a set of 12 24" dolphns from Amazon - they had a little hole in the fin so they can be hung from lots of different places - like the umbrella ribs of the patio umbrella. The set contains 6 blue and 6 pink dolphins. We used them for decorations and for pool party games. One cold February day I came across these dolphin floats and couldn't resist getting them. The water squirt gun hose goes down into the pool for an endless stream of water. We used these for races and for squirting the upright dancing dolphins. Divide the guests into two teams. Each team gets 4 splash bombs. One at a time the team member tries to hit one of the dancing dolphins with the splash bomb. The team that gets the most hits wins. 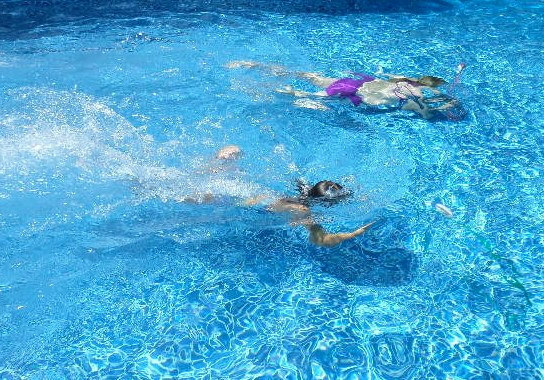 The "dolphins" try to get to the other side of the pool without getting tagged by "the shark." 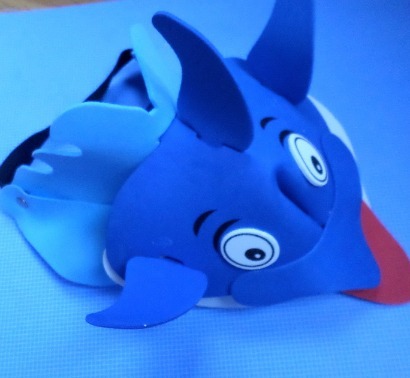 The fin is actually made of fabric - neoprene so it can get wet. 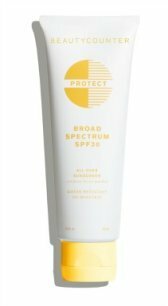 I found it at a local store - there is one at Amazon that is the same idea - but costs more. 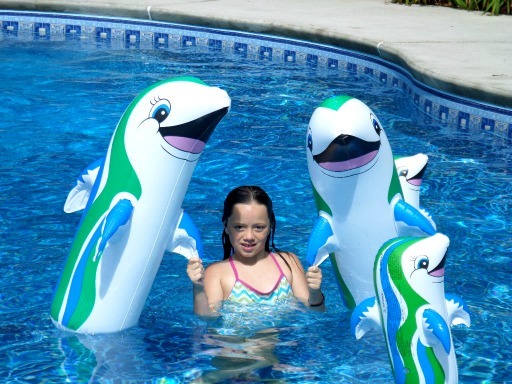 Kids each get an inflatable dolphin to hold and try to make it across the pool without letting it go or falling off. Weighted swim hoops sit on the bottom of the pool. Players swim through the hoops to find a weighted egg that contains a plastic dolphin. 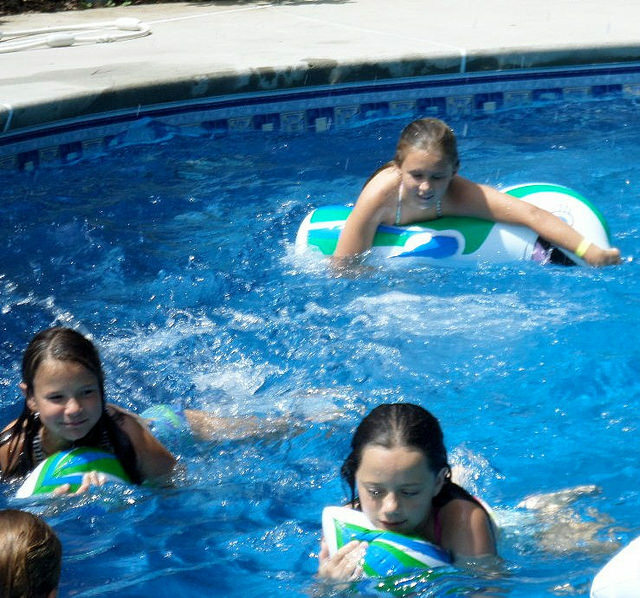 This is the second summer we've had the hoops - they are a favorite pool toy and provide lots of hours of entertainment. The favorite ride on toy .... "Beauty" as he was called by the girls provided lots of entertainment during free swim. 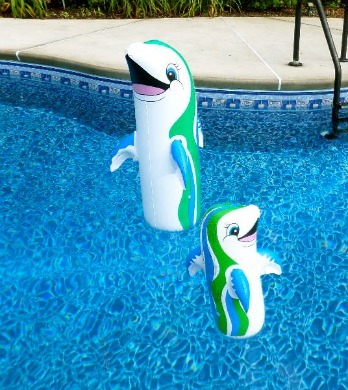 Found these dolphin floats with squirters at Amazon. Kids couldn't wait for their turn to ride them and squirt their opponents. They continue to be a source of pool fun whenever we have kids at the pool. 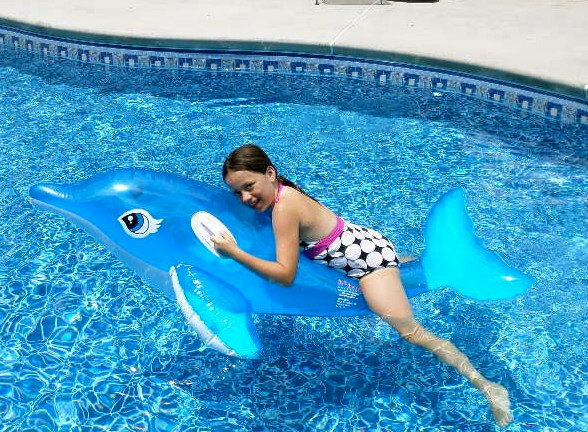 A dolphin swim ring can be used for pool races. 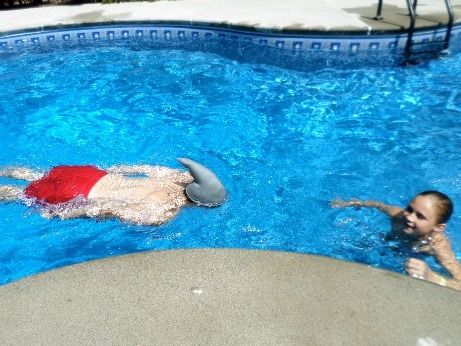 You can get this swim ring as a shark or dolphin - so get two different ones. The Shark Team races the Dolphin Team. Divide the guests into two teams. One at a time they need to sit in the float and swim to one side of the pool and back. The next team member jumps into the float. The team that finishes first wins. 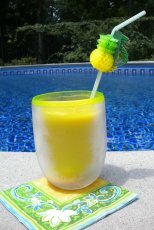 I also love to use swim rings to hang on the pool gate to greet the guests as they arrive. Dolphin visors make for great photo-ops or take home party favors. 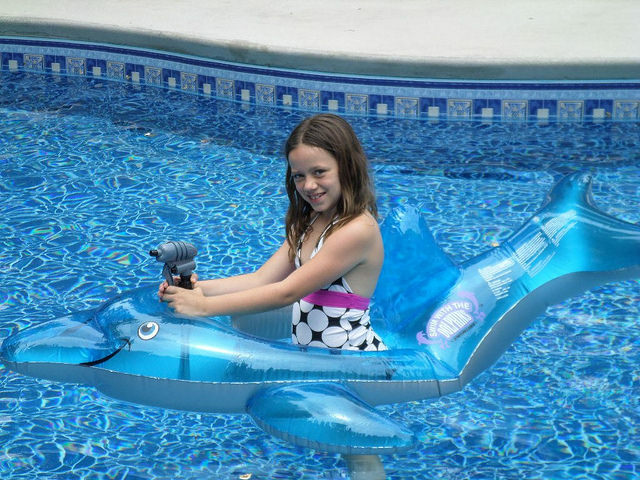 I could only find a set of sea visors that included a dolphin one - so I made sure the party girl got the dolphin one. 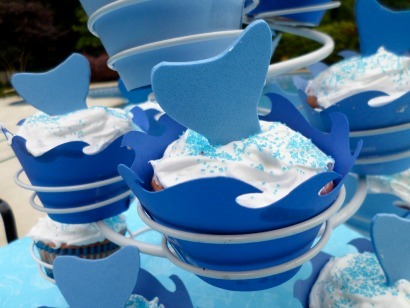 Using wave shaped blue cupcake wrappers and foam dolphin tails, we had our dolphin birthday cake. I found the wrappers at Etsy. I made the dolphin tails from a template using different shades of blue foam. Just stuck them in the white frosting and sprinkled some blue sugar on top. 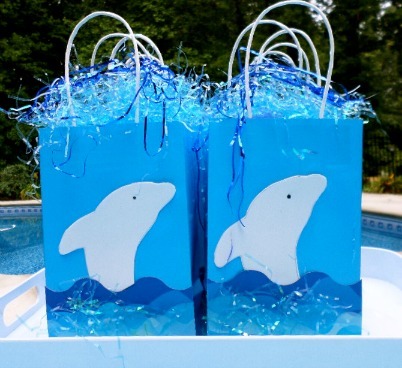 Using a wave bulletin border, glue it to the bottom of a blue gift bag. Some extra sparkle was added to the wave using spray glue and pressing on some blue sparkly Easter grass. Cut out dolphin shapes from white foam craft paper and glue to the bag. Instead of tissue paper using different shade of blue Easter grass to top it off. Our granddaughter claimed that her dolphin pool birthday party was the best ever and her friends agreed.